The jury is still out on whether the Obama administration will pass a cap-and-trade bill, but at least one utility is gearing up for potential regulations. Calpine Corp. announced this week that it plans to build the first power plant in the U.S. with a federal permit that sets a limit for CO2 output. The federal government didn’t request this–Calpine took the initiative to get the permit for the 600 megawatt natural gas plant, which will be located in Hayward, California. Calpine’s plant will use low-carbon fossil fuels in an efficient cycle that uses waste heat from a turbine to boil water, generate steam and create more electricity. Overall, the Russell City Energy Center will emit 50% fewer greenhouse gas emissions than advanced coal-powered plants and will spew out 25% fewer greenhouse gases than the California Public Utilities Commission’s standard requires. When the EPA’s Clean Air Act likely starts limiting vehicle emissions of greenhouse gases in March, it will force industrial sources to get permits. But not everyone thinks the act should be used to regulate heat-trapping gases. 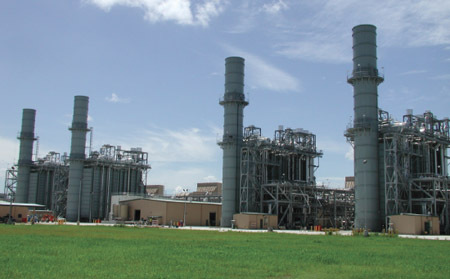 But Scott Segal, an industry attorney and director of the Electric Reliability Coordinating Council, said existing clean air permitting laws are inappropriate for regulating greenhouse gases. “As a general proposition, we believe that the use of permitting conditions to advance a CO2 regulatory agenda is an inflexible mechanism that is likely to have a number of unintended consequences,” Segal said. By limiting greenhouse gases through air permits, Segal said, facilities located in other regions of the country–including coal-rich areas–would be at a disadvantage. “There is no mechanism to either contain cost or allow for trading if you use permit conditions as a basis for regulating CO2,” he said. So coal power interests aren’t thrilled about the idea of using air permits to cut down on CO2. That makes sense. But if a federal climate bill falls to pieces, it makes sense to grab onto anything that helps reduce emissions. In any case, California’s planned cap-and-trade market will impact local utilities when it goes into effect in 2012.